Docebo allows you to quickly and easily manage users via CSV file, allowing these users to be imported, activated, or deactivated in the LMS in one action. To begin, log into your LMS as the Superadmin. Then, access the Admin Menu by scrolling your mouse over the gears icon in the left sidebar. In the Admin Menu, find the E-Learning Section, then press the Users subitem. On the main users page, you will see an action bar at the top. In this action bar, press the Manage Users via CSV button to continue. On the next page, you will see two tabs in a menu on the lefthand side: Import Users and Activation/Deactivation. Let’s begin in the Import Users tab. Now, you can upload a .CSV file and configure new settings. For a successful upload, it is important to correctly create a .CSV file. In order to view a correct example, selectDownload a sample CSV file manage users button in the righthand corder of the first section on this page. Please Note: The maximum file size of a CSV file that you’re able to import into your Docebo LMS for a user upload is 3MB. The system is configured to automatically detect the Field Separator, which is needed in order to organize the information by columns. Information can be additionally organized by a comma or a semicolon, depending on your needs. Then, flag the option that the first row is considered a Header (only if this fits your CSV file format), and select the File charset from the dropdown menu. For the File Chartset, we recommend UTF-8, which is standard. Please remember to use the quotation marks to delimit the text content. 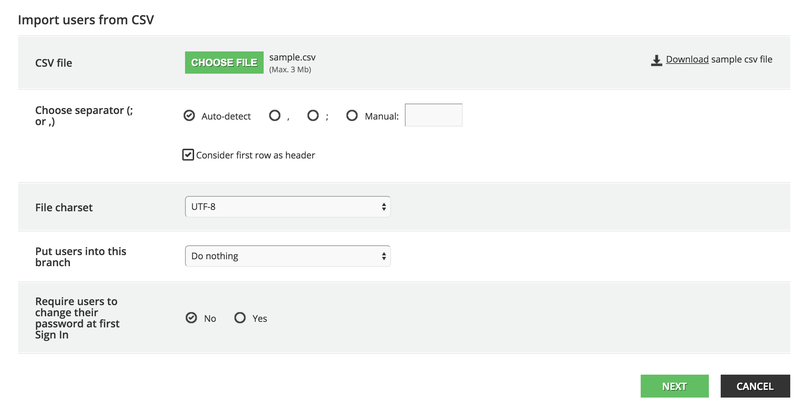 When you’re ready, select Choose File to upload your .CSV file. Then, use the Branch dropdown menu to choose in which branch of the organization chart you want to your users to be placed. 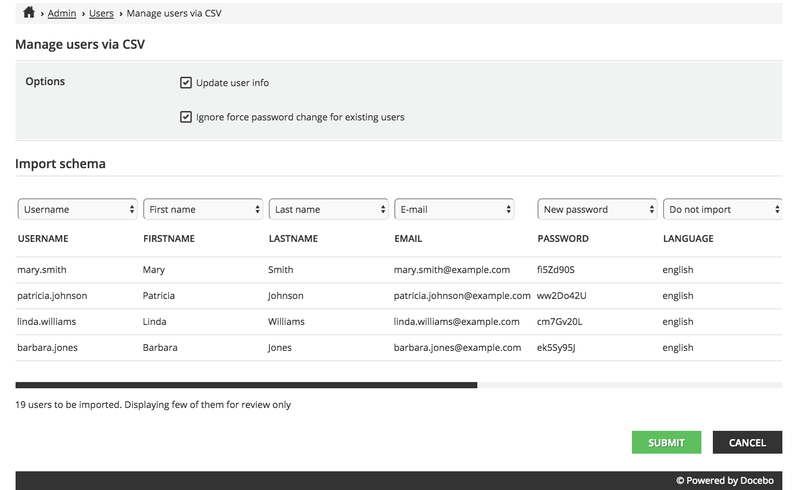 Finally, flag whether you want to require your users to change their password upon the first log into the LMS. Then, press Next to proceed. Now, associate the existing LMS user fields with the columns of the file using the corresponding dropdown menu in each column. If you’ve created any Additional Fields, they will be also appear in the dropdown menus. If the list you’ve imported contains users that already exist in the platform, you can flag the option to ignore the “force password change” option (if the force password changecolumn is present in your CSV file). Flag the first option in the top section to update user info. Then, the second option will no longer be greyed out, and you can flag the option to ignore force password change for existing users. Finally, select SUBMIT to upload the file. Once finished, your LMS will display the number of users correctly uploaded. Note: In case of upload errors, the system will display the names of invalid usernames. All users that were imported into the LMS will appear in the list on the bottom half of the main Users page, where you can edit their profile or delete them from the platform as necessary. When you’re importing users into your platform, you have the option to flag whether you want to force your imported users to change their passwords upon the first log into their platforms. For those using Docebo 6.9, you can also add this “force password change” functionality to your CSV file when importing users, and it will override whichever option you’ve flagged in your LMS. For example, if you’ve flagged the No option in the “Require Users to Change their Passwords at the First Sign In” section, you can still force your users to change their passwords upon their first sign into the platform by configuring the option in your CSV file. Then, when you upload the file into your LMS, you need to match the column name in the CSV file to the correct import scheme using the corresponding dropdown menu. If you’re using Docebo 6.9 or higher, you can also activate and deactivate a mass amount of users in your platform via CSV. To do so, press the Manage Users via CSV button in the action bar on the top of the main Users page. Then, on the next page, select the Activate/Deactivate tab from the lefthand side of the page. Begin by choosing the CSV file from your computer by pressing the corresponding button in the first section of this tab. 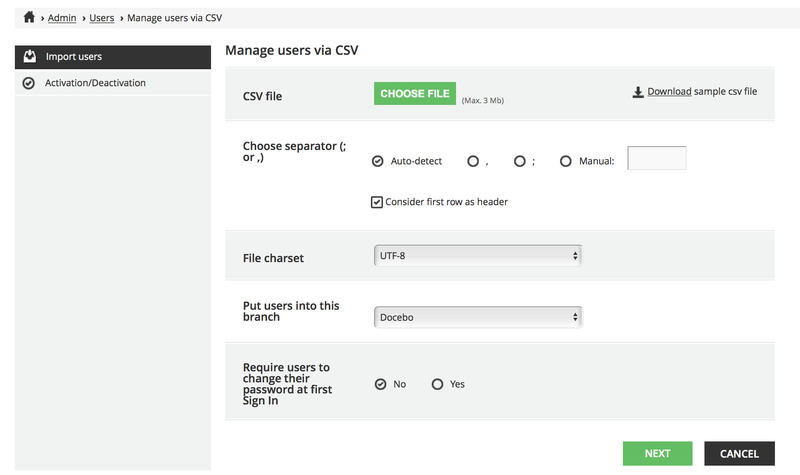 You can download a sample CSV file to make sure your CSV file is formatted correct, if needed. Then, select the File Chartset. We recommend UTF-8, which is standard. Finally, flag whether you want to activate or deactivate the users in the CSV file. Then, press Next. On the next page, follow the instructions by pressing Submit to complete the process. If the process was successful (without any errors), you will be redirected to the main Users Management page. If there were errors during the operation, you will see a pop up box displaying the list of errors that might have occurred during the process. You can download the CSV file with the list of errors.